Jon Anderson’s on-again, off-again recording project with fellow Yes alums Rick Wakeman and Trevor Rabin is apparently back on again. The three are passing around demos, and even contemplating a tour together. Anderson was a co-founding member of Yes, singing on 19 band projects between 1969-78 and 1983-2001. Anderson last appeared on stage with Yes in 2004, and officially departed four years later. He has since recorded a studio effort and live album with Rick Wakeman, who actually had five separate stints with Yes — in 1971-1974; 1976-1980, 1991-1992; 1995-1997 and 2002-2008. Trevor Rabin joined Yes just before 1983′s 90125, a project that he led into platinum success on the strength of Yes’ lone No. 1 hit single “Owner of the Lonely Heart.” He remained with Yes through 1994′s Talk, developing a growing creative relationship with Anderson. 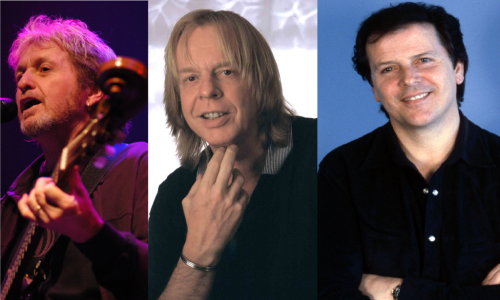 Rabin never worked with Wakeman on a studio project while with Yes, however, though they duo did tour together as part of the eight-man concert series in support of the 1991 album Union. He later was a guest on Wakeman’s 1999 concept album Return to the Centre of the Earth.